So we are into April. As I write this there are no MPs - parliament has been dissolved, and the so-called ‘short campaign’ has started. Across the country, PPCs like me are handing their forms and deposits into their local authority so that they are officially General Election candidates. To people who aren’t politics nerds, they’ll start to notice a barrage of election leaflets and stuff about elections on TV. Most of them will probably already be fed up with it all! For me, this is the final phase of a year-long campaign. 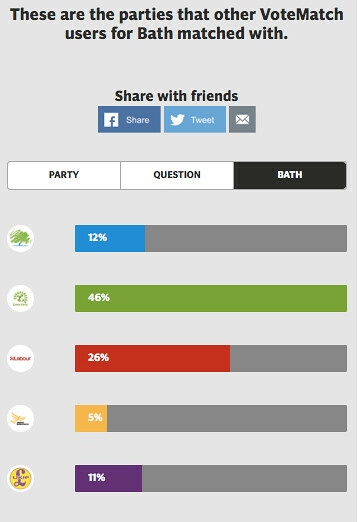 Bath has been one of the busiest constituencies in the UK for hustings and other events, and it is all rather exhausting. It is with some relief that I can see election day itself in sight, but there’s a lot to do before that! In Bath and North East Somerset there are local elections on the same day as the General Election, and the Green Party is standing candidates in every ward for the first time. This is great, and a reflection on our massively increased membership that we’ve seen explode over the last year or so. We’ve never had a councillor here, but it’s looking like we’ll get some this time so it’s all systems go. Then of course there’s the General Election. As you can see from the graph above, we’re doing pretty well! That graph is from the Telegraph - not known for being sympathetic to the Greens - and is a sign that we’re seeing a massive change. Support for the Lib Dems has collapsed, and that’s a lot of voters coming our way. Locally, Lib Dem campaigning has entirely consisted of ‘it’s a two horse race’ and ‘nobody but the Lib Dems or Tories can win here’ fearmongering. It’s the sort of political nonsense that people are fed up with, and it’s obviously also untrue, given that we beat the Lib Dems in the Euro elections last year. But we will see what happens. The posters are going up around the city. People are beginning to think about who they want to vote for in earnest. The choice is simple - it’s either me or one of the Tories wearing different coloured ties.